1 DID YOU KNOW ABOUT TANGERINES? Tangerines, mandarins, clementines or oranges?? …This is because Tangier was the first port from where they were taken by boat to Europe tangerines. A mandarin orange is a slightly smaller relative of the standard orange. The tangerine and clementine are varietals of the mandarin, much in the same way gala and fuji are apple varietals. Originated in China, hence the name. China is by far the largest grower and consumer in the world, with over 12 million tons harvested each year. Arrived in Europe in the 1800′s by way of North Africa, where a large varietal was grown in Morocco. 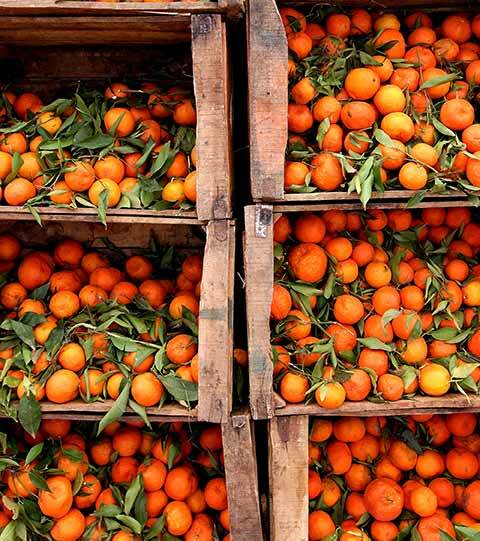 Exported through the port of Tangier, the fruit became know as Tangerine. Fruit is small and seedless, and has become very popular in the US. As it is sterile (no seeds), shoots need to be grafted onto other varietals. This varietal was created by a French missionary in Algeria over 100 years ago. His name was Marie-Clement Rodier. According to the Oxford English Dictionary, the word “tangerine” was originally an adjective meaning “Of or pertaining to, or native of Tangier, a seaport in Morocco, on the Strait of Gibraltar” and “a native of Tangier.” The OED cites this usage from Addison’s The Tatler in 1710 with similar uses from the 1800s. The adjective was applied to the fruit, once known scientifically as “Citrus nobilis var. tangeriana” which grew in the region of Tangiers. This usage appears in the 1800s. See the Oxford English Dictionary, 2nd edition, 1989. This fruit is referred to as Kamala kaya in Telugu and Portugal through the Caribbean. In Australia the fruit is known as a Mandarin. 1842, from tangerine orange (1820) “an orange from Tangier,” seaport in northern Morocco, from which it was imported to Britain originally. As an adjective meaning “from Tangier,” attested from 1710, probably from Spanish tangerino. As a color name, attested from 1899.